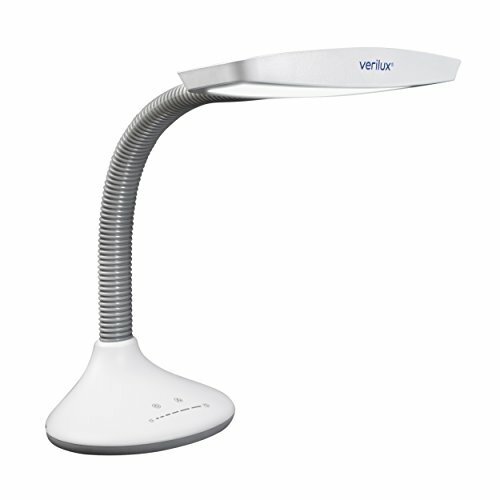 The Verilux LED SmartLight provides a durable and compact lighting solution for students, professionals, artists, and hobbyists in one energy-efficient and full-spectrum desk lamp. Using a extended-life LED bulb, the SmartLight delivers state-of-the-art natural spectrum lighting with a stylish and modern design. 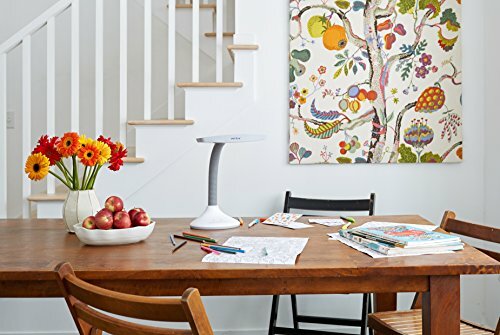 Perfect for small spaces, the SmartLight will fit seamlessly into your workspace for a non-intrusive source of natural light while the handy on-base USB charging port keeps you and your devices connected. Discover the advantages of full-spectrum lighting for yourself with the SmartLight. A superior alternative to traditional artificial light, natural spectrum illumination accesses specific sections of the light spectrum in order to emulate characteristics of natural daylight. Built on more than 50 years of scientific research, the SmartLight can reduce eyestrain when compared to traditional desk lamps. Too tired to work or study? The SmartLight reduces glare and increases visual clarity, lessening fatigue and allowing users to work or study longer without discomfort. 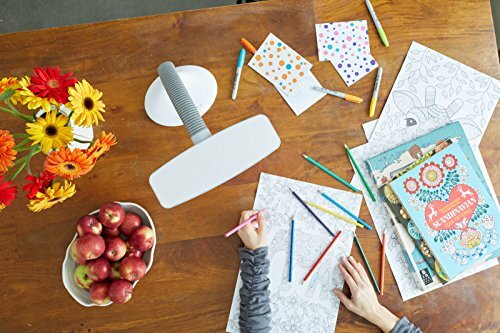 Ideal for artists, crafters, and hobbyists, the SmartLight mimics the qualities of natural sunlight, providing true color representation and allowing you to work on your project anytime. LED BULB & NATURAL SPECTRUM LIGHT - Having long-lasting LED light means that you'll never have to change a bulb again. LED light provides better illumination and truer color representation for detailed work and art or craft projects. VERSATILE LIGHTING - This desk lamp is perfect for students, professionals, artists, and hobbyists. It includes an adjustable neck and dimmable light intensity. In addition, its compact base makes it perfect for small workspaces. On base USB charging port keeps you and your devices connected. REDUCES EYE STRAIN & FATIGUE - This lamp's natural spectrum LED lighting mimics natural daylight and its Optix lens reduces glare, letting you work or study longer with more productively. CONTEMPORARY DESIGN - This is a sleek and modern take on the traditional gooseneck desk lamp. It has an elegant white and gray design with a simple on/off switch, a flexible neck, and flicker-free electronic capability. ETL CERTIFIED & ONE-YEAR WARRANTY - With our independent worldwide safety recognition for maximum customer satisfaction, we know that you will love your SmartLight. If you have any questions about this product by Verilux, contact us by completing and submitting the form below. If you are looking for a specif part number, please include it with your message.